Dr Lockie was great ! Very informative about everything and she answered all of my questions. She gave me an adjustmentand I feel so much better. I definitely recommend her! Dr Lockie was great ! Very informative about everything and she answered all of my questions. She gave me an adjustment and I feel so much better. I definitely recommend her! Her office has great energy, I was taken care of right away and I really appreciated the background music. Fantastic experience,and I feel much better! Her office has great energy, I was taken care of right away and I really appreciated the background music. Fantastic experience, and I feel much better! 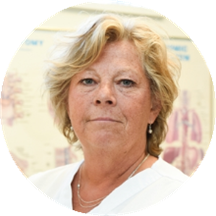 Janet Lockie is a concerned and considerate chiropractor caring for the Farmingdale, NY community. Dr. Lockie obtained her chiropractic degree from New York Chiropractic College. She also completed her additional specialty training in Child Abuse and Violence Prevention and received a certificate from St. Joseph's College. Dr. Lockie is a part of Lockie & Nowachek Family Chiropractic. She is also a member of the International Chiropractors Association. Patients see Dr. Lockie for a variety of reasons, including weight loss consultations, nutrition consultations, sports nutrition evaluations, spinal decompressions and chiropractic adjustments. During her consultations, Dr. Lockie fully explains patients’ conditions and helps them choose an appropriate treatment plan. She is dedicated to helping patients receive the treatment they need so they can enjoy a positive and fulfilling lifestyle. So friendly and knowledgeable. Really felt so good walking out of there ! playing showtunes might not be everyone’s cup of tea, but it’s certainly mine! it made for an extremely pleasant visit, even before i spoke to anyone. everyone was friendly and professional, being informative while also being amicable. definitely looking forward to the next visit! The speed of service was extremely efficient. The ladies in the office were so nice and caring. Both doctors who saw me were knowledgeable and made me feel so much better. She's absolutely a delight and a most gifted practitioner. She's absolutely one of the best doctors I have ever had the pleasure of being treafed by. She's very knowledgeable, yet, so warm and friendly. I highly recommend Dr. Lockie. Friendly staff. They make you feel comfortable. Great office of ladies. Very nice and personal. They also play fun themed music each day they are open. Very personable, was my first time visiting, told me what was going on, what they were doing, and why they were doing it. Going back next week and looking forward to it. The office staff is so friendly and the doctors are welcoming with great bed side manner. They make you comfortable and explain everything excellently. I highly recommend them to anyone! Amazing doctors!! So happy I found them. Staff also very friendly and gave a great welcome feeling which is extremely important when you aren't feeling well. I Highly recommend. Amazing. Dr. Lockie, listened to me and attended to my needs. She gave me an adjustment that my neck was yearning for. I've never heard so many nitrogen bubbles pop! I will definitely be back for another visit this week. She and her staff are so sweet and so much fun! Janet takes the time to talk with you and discuss your situation, treatment plan, and exactly what is going on with you. She she's hysterical! Loved her and her colleague. Thorough in explanations, great personalities and very professional. Whole office was very professional and thorough in their explanations! Felt like they actually cared about your personal situation and didn't just churn you in and out of the office like everyone else. I couldn't have asked for a better experience. The entire staff was warm and friendly, made me feel right at home! I have never felt more comfortable in a doctors office. If you have even the slightest interest about doing somethingabout your back pain, they are the ones to help. Feeling better, thank you to the both of you, neck is a little bit looser now, headache subsiding a bit. Appreciate your help. She was amazing and you can feel she really wants to make you feel better.